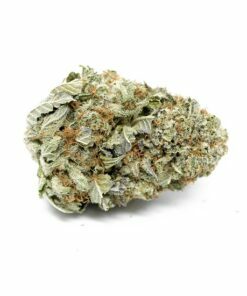 This potent indica hybrid, with a sativa/indica ratio of 10:90, can reach THC levels of up to 20%, which makes it one of the stronger medical strains around. Master Kush is a crossbreed of an original Hindu Kush strain and a pure skunk strain, though the exact genetics is unclear. These are among the strongest plants in the world. And Master Kush is one of the best-known strains in the world, winner of two Cannabis Cup awards and a personal favorite of Snoop Dogg. It was designed in the Netherlands and remains popular there, while it sells especially well on the West Coast of the United States. Master Kush Strain has a pungent but sweet earthy flavor and a light citrus smell that can be hard to detect. The dominant feeling while high is one of total relaxation, along with euphoria and sleepiness, all products of the strain’s genetic heritage. This makes Master Kush a good treatment for sleeplessness. Other conditions that benefit from Master Kush include anxiety, mental health problems, and migraines. Negative effects are limited, though the dry mouth is possible as always.